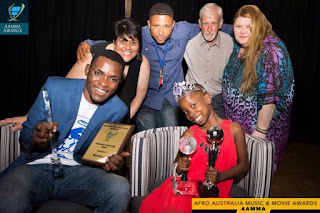 Nigerian Comedienne Little Emmanuella is unstoppable.She has been crowned the Princess of Comedy by the Australian Government while Uncle Mark Angel was Honoured with a leadership Award. Emmanuel becomes the youngest recipients of the Afro -Australia Music & Movie Awards (AAMMA).The youngster was given to her in Sydney, Australia.She won 2 awards – Best new comedienne & Princess of Comedy. The AAMMA AWARDS was established by Scrim Entertainment (owned by Daniel Okoduwa) to celebrate artists of African origin irrespective of borders or national identities. Mark Angel Comedy Won Best Subsaharan Channel In The Just Conclude Youtube Awards.